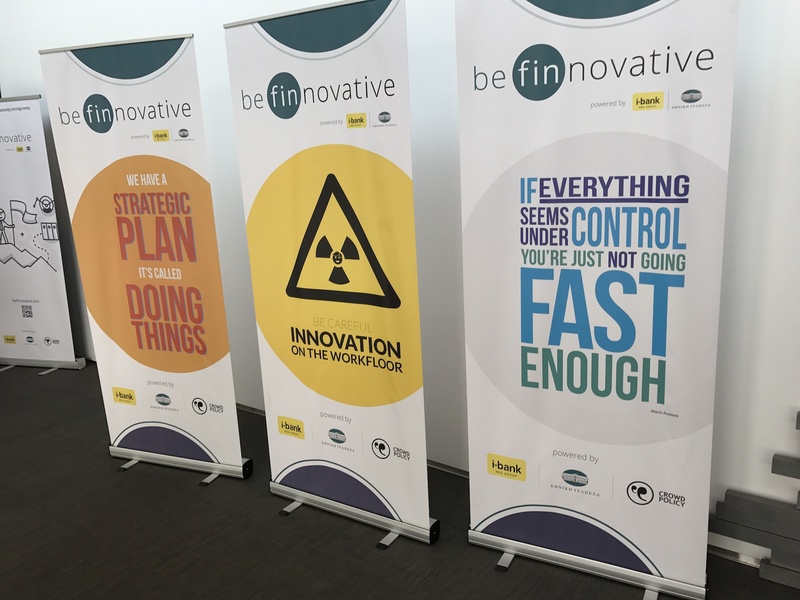 Nelly Tzakou-Lambropoulou, general manager of retail banking at National Bank of Greece, outlines the creation of the ‘Be Finnovative’ accelerator programme and explains why fintechs are critical to the success of the financial services industry. Why did you create Be Finnovative Accelerator? Be Finnovative Accelerator has been established as part of our digital strategy and following on our significant experience in supporting the start-up ecosystem in Greece via NBG Business Seeds, a holistic programme to foster young, innovative entrepreneurship. In 2015 we started collaborating with Crowdpolicy, a fintech specialised in open innovation programmes, working on a donation and equity crowdfunding platform named act4Greece. As a next step and looking at how financial institutions abroad work with fintechs, we co-organised the first fintech hackathon in Greece in April 2016. The hackathon gave us the opportunity to work during an intensive weekend with more than 50 young developers, 16 teams in total. During this process we realised that a mechanism that would support these teams in a more structured way and on a continuous basis is required. Moreover, we had just released our open API (Application Programming Interface), which external developers used for the first time, and the accelerator would provide an ideal playground to test more ideas. In making Be Finnovative we took examples and takeaways from other similar programs across the globe and tailored them to the particular needs of the Greek digital economy. Be Finnovative invites young people with high level of expertise such as developers, designers, students, business executives to develop financial products and discover new technologies. It is an impact accelerator which means that participants are not required to offer anything to the organisers in return. While the international fintech industry consists of mature ecosystems, in Greece we are still at an early development stage. Our aim is to support fintech startups that keep up with the pace of technological change to create viable value propositions. When a team enters this kind of process they have the idea, they have a technical skillset but they need a lot of mentoring and support to be transformed into an interesting business model. We provide them exactly that, from lean startup concepts to MVP development, pitching, regulation consulting, go-to-market and other critical areas that need to be tackled. They leverage the Open Bank API provided by NBG and the expertise and resources brought by key players such as Accenture, Amazon, McKinsey, Microsoft and VISA. At the end of the programme we want to have some ideas that could be attractive for NBG to implement but also potentially fundable. One of our KPIs is the total value of the teams graduating from the programme, as measured by cash flow projections. Other directions we might explore is to make the accelerator more outward looking by inviting teams from abroad while sending some of our teams to target international markets. Greek financial market is the right place for startups to pilot their models and offers an attractive proposition for developers. Be Finnovative accelerator has been received with enthusiasm, as many young and talented people with high level of expertise have shown great interest to participate in this first attempt by a large banking institution. We tried to enrich the selection process by organizing match-making sessions and open days before the proposal expiration date so that more teams could have the chance to compete. Finally 59 proposals were submitted online and evaluated by 22 independent judges from National Bank of Greece, program supporters and experts from the business and academic sector. The selection process ended with an intensive 3-day bootcamp where 23 teams participated and had the opportunity to explore and evaluate ideas, skills and performance. All teams with the help of mentors worked on design thinking, fintech idea evaluation, business model canvas and pitching deck exercises. On the pitching day, 10 teams were selected to attend the 1st cycle of the “be finnovative” accelerator that will last 6 months. Thematic areas include: chatbots for transactions and payments, e-wallets, management of digital assets for creative industries with the use of blockchain, fraud detection systems and personal financial advisors. Since the kickoff in the beginning of November we have already completed the first sprint sessions and had experts from Greece and abroad to transfer knowledge in the teams. How do you expect fintechs to impact financial services in the years to come? Investments in the fintech sector have significantly increased in the last 5 years, reaching more than U$22 billion in 2015. Although there is slow-down in 2016 there is still appetite for attractive models and lots of activity by startuppers. The key strengths of fintech companies complement incumbents’ week points, such as agility and innovation edge. Large financial institutions have the scale and the compliance experience that fintechs lack so all this creates the perfect setting for collaboration. Europe and US banking players do not experience at the moment a high level of corrosion in revenue sources coming from these value propositions; in US it has been measured at 1%. This changes rapidly and we will soon reach a tipping point, especially in some retail segments. Consumers drive this change as they set a very high bar of expectations on the digital interface front. However successful we might be at improving our front-end we are forced to achieve full digital transformation in order to stay relevant. Even fintech giant Paypal continues to adjust its business model to become more diversified by issuing credit solutions and mobile applications where the users can locate, shop and pay at nearby stores that accept payment by PayPal on the go. As a result we will see new business models that will be based on major technological trends and fintech integration. The final verdict will be provided by the end user. This article was published on EFMA (link – pdf).